The Grundy County Sheriff's Office will be accepting applications for Sheriff's Police Explorers through October 31, 2018. 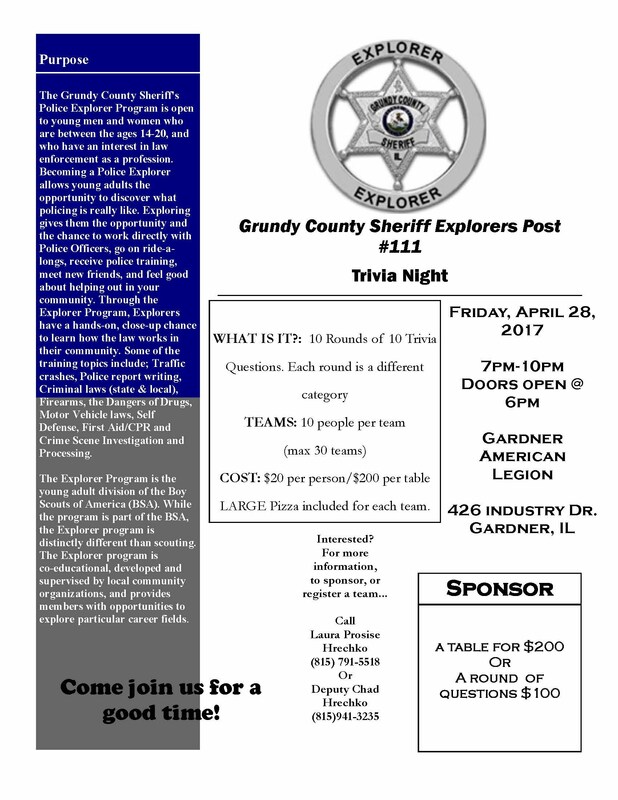 The Grundy County Sheriff's Police Explorer Program is open to young men and women who are between the ages 14-20, and who have an interest in law enforcement as a profession. Becoming a Police Explorer allows young adults the opportunity to discover what policing is really like. Exploring gives them the opportunity and the chance to work directly with Police Officers, go on ride-a-longs, receive police training, meet new friends, and feel good about helping out in your community. Through the Explorer Program, Explorers have a hands-on, close-up chance to learn how the law works in their community. Some of the training topics include; Traffic crashes, Police report writing, Criminal laws (state & local), Firearms, the Dangers of Drugs, Motor Vehicle laws, Self Defense, First Aid/CPR and Crime Scene Investigation and Processing. To fill out an application visit the documents section of this page. For more information about the Sheriff's Police Explorers you may call Deputy Chad Hrechko at (815) 941-3235. 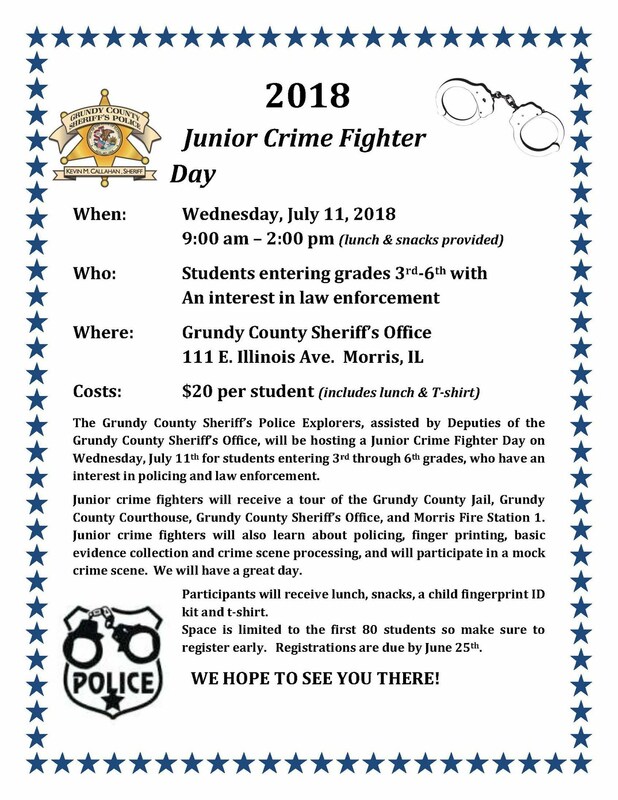 Sheriff Kevin Callahan will be hosting another "Junior Crime Fighter Day" at the Grundy County Sheriff's Office. This year the event will take place on July 11th from 9:00AM - 2:00PM. Students entering grades 3 - 6 are welcome to attend the event. 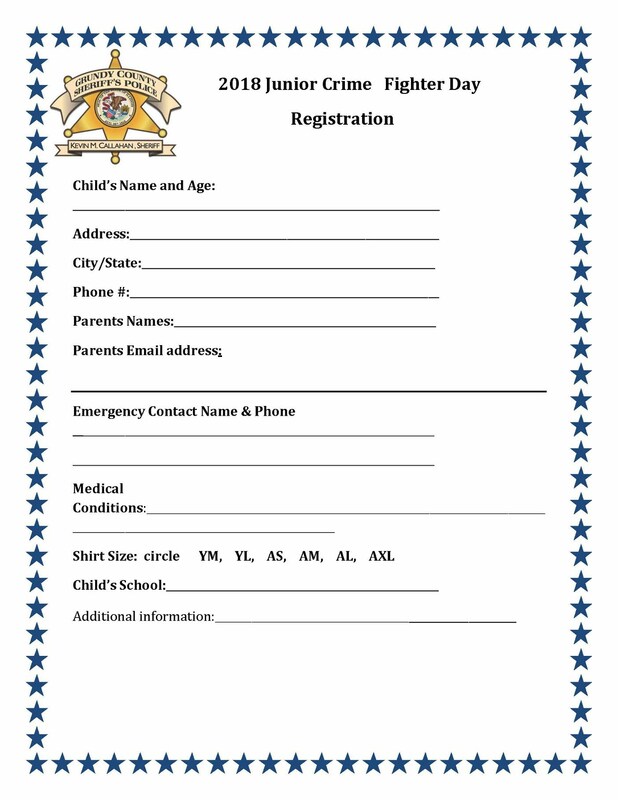 Below is a copy of the flier along with a registration form. Registration is due by June 25th. This event is open to the first 80 children to register. We hope to see you there! On January 13, 2018 the Grundy County Sheriff’s Police Explorers held their annual recognition banquet. Explorers were recognized for their achievements during 2017. Nine new explorers were welcomed and introduced. Past explorers that aged out, moved, and joined the military were also recognized. The state Exploring competition team was recognized for their individual and team trophies that they earned at the 2017 Explorer state competition and conference in July. Explorers Matt Anderson and Alicia Headrick were promoted to the rank of Sergeant and Explorers Kade and Avery Ohlendorf were promoted to Corporal. Tyler Post, Kade Ohlendorf, and Avery Ohlendorf were recognized as the top shooters for 2017. Explorers also selected Haley Sohan and Dave Cronin as the most dedicated, Julia Santiago and Kade Ohlendorf as most improved. Selected by the Explorers as their favorite deputy to ride along with was, Deputy Sean Wojtczak. Congratulations to Explorer Alicia Headrick who received the Sheriff Kevin Callahan award, and Explorer Matt Anderson who was selected as the 2017 Explorer of the year. Congratulations to all of our Explorers! The Grundy County Sheriff's Office will be accepting applications for Sheriff's Police Explorers through October 18, 2017. Mark your calendars for our 4th annual trivia night fund raiser. April 28, 2017 from 7:00PM to 10:00PM at the Gardner American Legion, doors open at 6:00PM. For those of you who are unfamiliar with a trivia night we will have 10 rounds of 10 trivia questions, each round is different category. The cost is $20.00 per person with 10 people to a team. Round sponsors are available for $100 each. Each team will receive a Large Pizza with their entry fee. This is the Explorer's largest fundraiser of the year. We use funds raised for training events, competition entry fees, and equipment purchases. Thank you for your interest and we hope to see you there. The Grundy County Sheriff's Office will be accepting applications for Sheriff's Police Explorers through September 23, 2016. For more information about the Sheriff's Police Explorers you may call (815) 941-3122, or visit the documents sections of this page to fill out an application. Mark your calendars for our 3rd annual trivia night fund raiser. April 15, 2016 from 7:00PM to 10:00PM at the Gardner American Legion. For those of you who are unfamiliar with a trivia night we will have 10 rounds of 10 trivia questions, each round is different category. The cost is $20.00 per person with 10 people to a team. Round sponsors are available for $100 each. Each team will receive a Large Pizza with their entry fee. This is the Explorer's larges fundraiser of the year. We use funds raised for training events, competition entry fees, and equipment purchases. Thank you for your interest and we hope to see you there. For additional information contact Sergeant Paquette at (815)941-3122. Sheriff Callahan, John Hollmeyer, Sara and Kevin Krople of Turtle's Tap, Walmart, Corleone's Restaurant, the Grundy County Sheriff's Police Association, Laura Hrechko, Sarah Bogard, Jeff Hanley, Craig Williamson, ILEEC Director Jeff Dalton, Grundy County EMA Director Joe Schroeder, and our Explorer parents for their support and generosity. ILEEC Director Jeff Dalton presented the Grundy County Sheriff's Police Explorer Post #111 with the Explorer Post of the Year Award. The Post of the Year Award is selected by the Illinois Law Enforcement Explorer Committee.